It’s been a while since I posted anything, but I recently started painting my Squig Gobba. I went for a purple and red colour scheme. The base will be very green and swampy, and the vomit will be yellow and slimy so that the contrast between colours will make them pop! 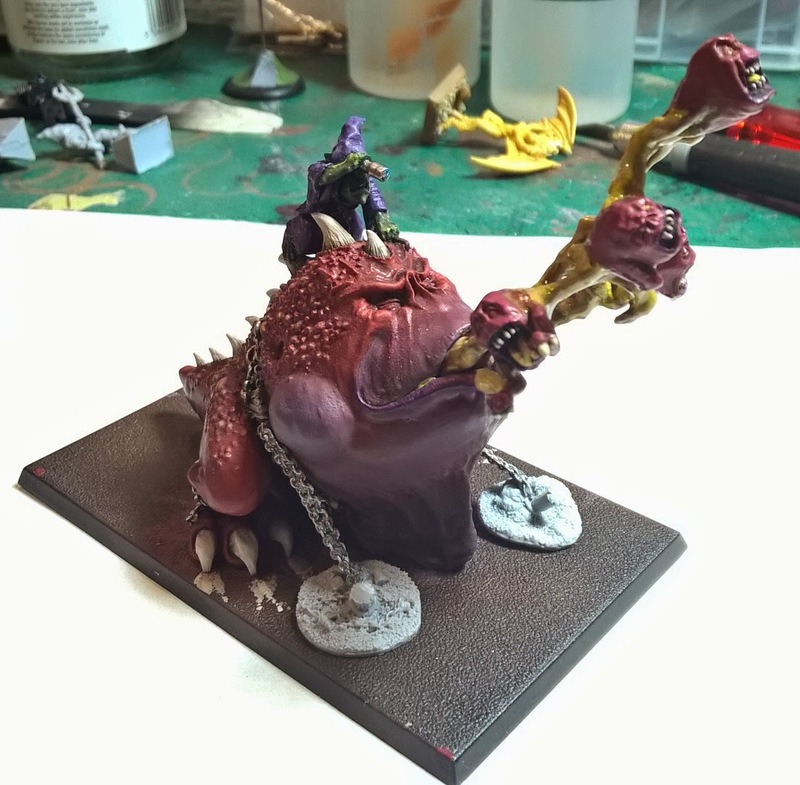 Even though this is a Squig gobba I am painting, for the main colour I wanted to make sure this squig tied in with all of the smaller Squigs in my collection, as well as loving the classic squig red. My style of painting takes a long time. There are many layers of slightly different shades, as I believe it makes the unnatural subject and colours seem more realistic. I add the splashes of colour because it looks striking and add character to the model. 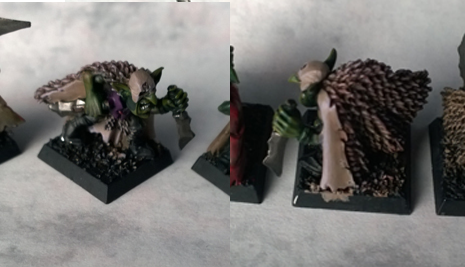 I was originally going to paint the Squig Gobbas stomach in a similar colour scheme as the inside of this Goblins cloak, but opposite. Using purple as the base colour and highlighting up to almost a skin tone. In the end I really liked the way the pale purple looked next to the red, and it gave me great ideas for end result. Such as the green base, and the yellow vomit. The vomit has been the hardest thing I have ever tried to paint so far! I just didn’t know how to go about painting it. I ended up base coating it iin a dark yellow, and highlighting up with a flesh colour. I was trial and error painting to be honest. I next used GWs Nurgle’s Rot to cover the whole of the vomit, and the bottoms of the squigs. I was undecided at first on whether to blend the vomit into the squigs or to make it look as if the vomit is on top of the squigs. I tried to use Nurgle’s Rot to blend the two in the end. I didn’t like it. I finally decided to just paint and see how it goes. I used the original colours mixed into water effect. Many, many layers, of both water effect and Nurgle’s Rot. That Squig gobba is brilliant.